* The spacings betwwen the characters in the term – S e n s e – represent its non-sensical inherent cuts (factual and ontological). ** The movement of the Art Object (of the artistic and aesthetical object in the artistic project –not just displacement: change and dynamic of space, of time, of rythm, of nature; neutralizing of Sense and meaning–) to the Nonsense co-presence in the Open Project (art + non artistic –natural phenomenas / non-ontology–), makes possible the –Splitting: of the object of desire, of the object of representation and of the agency of the subject-object / the Dissociation of the subject's (existential void-trauma expiation) Self-projection/symbolical trascendence, and of his/its identification, and of the cultural-historical performative transformation of the reality and territorialization. All these splittings provide a suprasubjective position for the observation of the –structures of unconsciousness, subconsciousness and consciousness–, the splitting of the aesthetic negativity and of the desire negativity or compulsive desire spiral (Will to Power), the splitting of the positivity of the empir(e)ical (observation) or of the Sensical and ontological devices (Digital ressentiment of the hypermodern sensibility of the ‘last will: “will nothingness rather than not will at all” the essence of completed nihilism, surplus positivist), and the splitting of the artistic project functionality. These movements and splittings aim a preliminary and discontinuous neutralizing interval of the autonomous-symbolic production and of the sovereignity of Art –by its critique challenge to the rest of the discurses–(being so, always subordinated to the ontological, to the causality and functionality of Sense –and its inherent non-senses–), reaching the suprasubjetive contact mode for a co/real co-presence between the Sense (Splitting of its transimmanence, subjectivity, intentionality or its infinite deferrall) and the objectivity and undecidability of the Nonsense (without agency of Sense –configuratively discontinuous due to the interpretations of the inter-subjectivity– and without anthropocentric performativity). Thus, the artistic discontinuity –which interval cuts- the Art Object through that natural and external Nonsense–, enable an ‘Open Work’ (the unfinished) in con-tact with the Nonsense, not to be just anthropologically (viewer/author) completed, but where the Sense of the Being [neutralized its Will to Power (values) in the instinctive will to will (but assuming the natural discontinuity of life and possible multiverse) through the cut of the Ego negative reflection /symbolical trauma emancipation] and the Nonsense, are liberated and not mediated to generate free co-agency and an existence of Open present-Free present (non-chronomorfic time / non-capacity / non-production / non-demonstration). 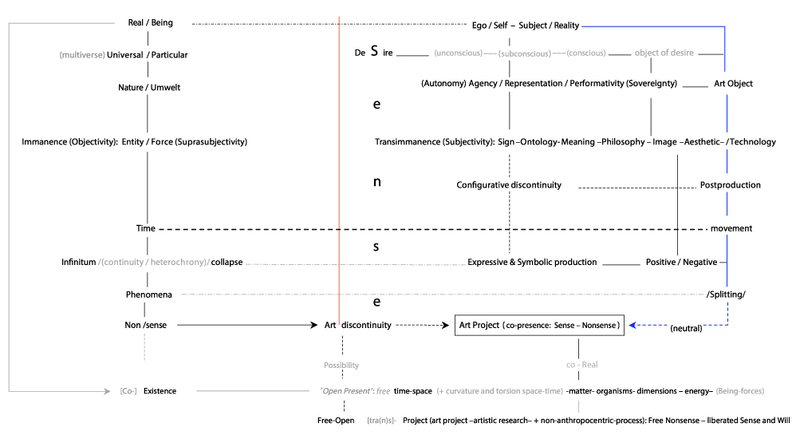 This splitting-off neutralizes respectively the different paths and layers of ‘differance’ freeing the Art Object in an Open Project [tra(n)sprojectual, beyond the project of the subject or his anthropic action or Faktizität, post-project beyond the postmodern and referential, reflexive or trascendental project] –where the Sense can be re-activated with a balanced instinctive will –pulsion–/+ desire, for a free subject: objective, subjective and presubjectively.